RStudio addins and R functions that make copy-pasting vectors and tables to text painless. datapasta is about reducing resistance associated with copying and pasting data to and from R. It is a response to the realisation that I often found myself using intermediate programs like Sublime to munge text into suitable formats. Addins and functions in datapasta support a wide variety of input and output situations, so it (probably) "just works". Hopefully tools in this package will remove such intermediate steps and associated frustrations from our data slinging workflows. Linux users will need to install either xsel or xclip. These applications provide an interface to X selections (clipboard-like). Windows and MacOS have nothing extra to do. Recommend Ctrl + Shift + t as shortcut. Table can be delimited with tab, comma, pipe or semicolon. vector_paste which will paste delimited data as a vector definition, e.g. c("a", "b") etc. Recommend Ctrl + Alt + Shift + v as shortcut. vector_paste_vertical which will paste delimited data as a vertically formatted vector definition. df_paste which pastes a table on the clipboard as a standard data.frame definition rather than a tribble call. This has certain advantages in the context of reproducible examples and educational posts. Many thanks to Jonathan Carroll for getting this rolling and coding the bulk of the feature. Recommend Ctrl + Alt + Shift + d as shortcut. Pivot a c() expr between horizontal and vertical layout. Reflow messy tribble() and data.frame() exprs. Recommend Ctrl +Shift + f as shortcut. Toggle Vector Quotes will toggle a c() expr between all elements wrapped in "" and all bare unquoted form. Handy in combination with above to save mucho keystrokes. Recommend Ctrl +Shift + q as shortcut. dpasta accepts tibbles, data.frames, and vectors. Data is output in a format that matches in input class. Formatted text is pasted at the cursor. dmdclip accepts the same inputs as dpasta but inserts the formatted text onto the clipboard, preceded by 4 spaces so that is can be as pasted as a preformatted block to Github, Stackoverflow etc. The only hard dependency of datapasta is readr for type guessing. All the above *paste functions can be called directly instead of as an addin, and will fall back to console output if the rsudioapi is not available. 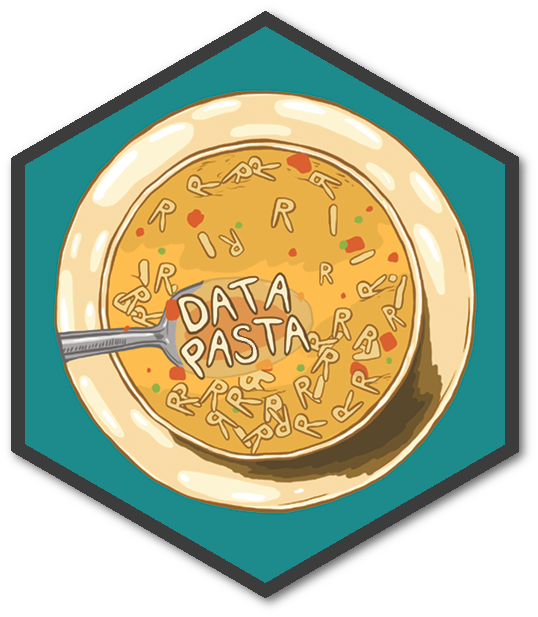 On system without access to the clipboard (or without clipr installed) datapasta can still be used to output R objects from an R session. dpasta is probably the only function you care about in this scenario. Followed by install.packages("clipr") to enable clipboard features. Quoted csv data, where the quotes contain commas will not be parsed correctly. Nested list columns have limited support with tribble_paste()/dpasta(). Nested lists of length 1 fail unless all are length 1 - It's complicated. You still get some output so it might be viable to fix and reflow with Fiddle Selection. Tread with caution. This package is made possible by mdlincon's clipr, and Hadley's packages tibble and readr (for data-type guessing). I especially appreciate clipr's thoughtful approach to the clipboard on Linux, which pretty much every other R clipboard package just nope'd out on. I am interested in expanding the types of objects supported by the output functions dpasta. I would also like to eventualy have Fiddle Selection to pivot function calls and named vectors. Feel free to contribute your ideas to the open issues. When pasting from clipboard it now attempts to guess if there is no header row, in the case where the clipboard is all data. If you're lucky it will create a default header for you when pasting (V1, V2, V3 etc.). dpasta() will now handle tribbles with R classes that cannot be represented in tribble form. It falls back to their character representation. This works well for things like dates. New addin: 'Fiddle Selection'. This is a kind of magic wand that can be waved over RStudio editor selections to: Reflow messy tribble and data.frame definitions, create c() expressions from raw data, and pivot c() exprs between vertical and horizontal format. New addin: 'Toggle Vector Quotes'. Given a horizontal or vertical c() expr, it will toggle all elements between quoted and bare format. Complies with new CRAN policy on clipboard use. You cannot write to the clipboard in non-interactive sessions with dmdclip() - Why would you?. Tests containing clipboard use are skipped on CI and CRAN. Added a trailing newline after all pastes, this works much nicer for console output. Fixed handling of backslashes. Relying on built-in function deparse() for escaping chars that need it. 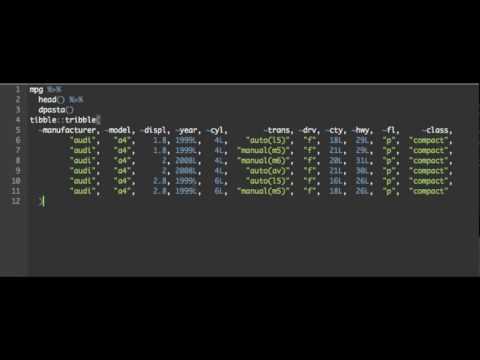 Added the ability to parse objects from R and output as neatly formatted tibbles, dataframes and vectors with dpasta. The clipboard is not involved. Added the ability to send these same types of objects to the clipboard formatted for markdown output with dmdclip. Package can now operate in a close to fully featured way in editors other than RStudio. Output goes to console rather than cursor. Added hooks for output customisation with _construct() functions that return the formatted output as an R character vector. The decimal mark can be set for numeric data with dp_set_decimal_mark. User can now paste natural looking comma separated lists as vectors, with automatic comma-splitting and whitespace trimming. Better handling for empty lines that get accidently copied onto clipboard with table. Gracefully ignored. Added new addin 'Paste as vector (vertical)' to provide nicer formatting for long lists. All addins now guess data types and format correctly in the source editor. Empty rows in tables and empty cells in lists are formatted as NA's when pasting instead of being ignored. Added vignette, automated tests etc in prep for CRAN submission. Added graceful error handling on failed parse of text on clipboard to table. tribble_paste() and vector_paste() now pastse NA's as unquoted, so R will parse as propper NA. tribble_paste() can parse an paste table text copied from raw delimited file e.g. csv, tsv, pipe delimited, seimi-colon delimited. vector_paste() uses a space between elements.